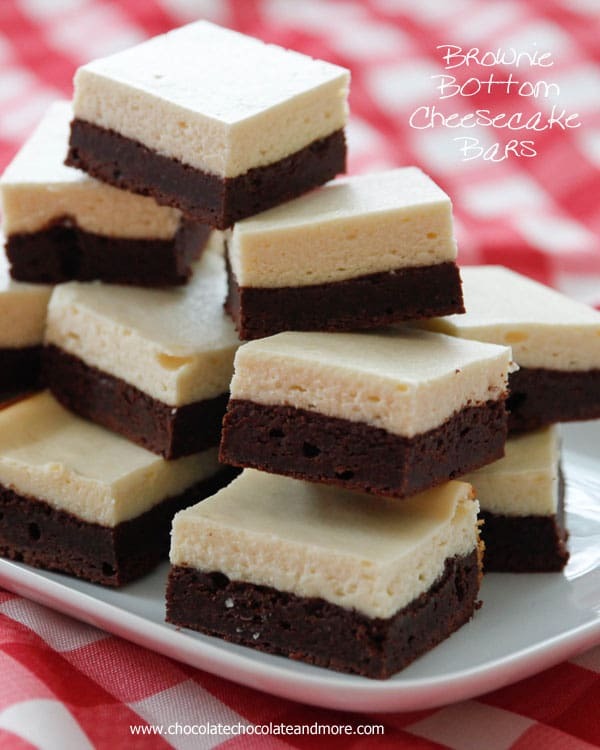 Brownie Bottom Cheesecake Bars - Chocolate Chocolate and More! 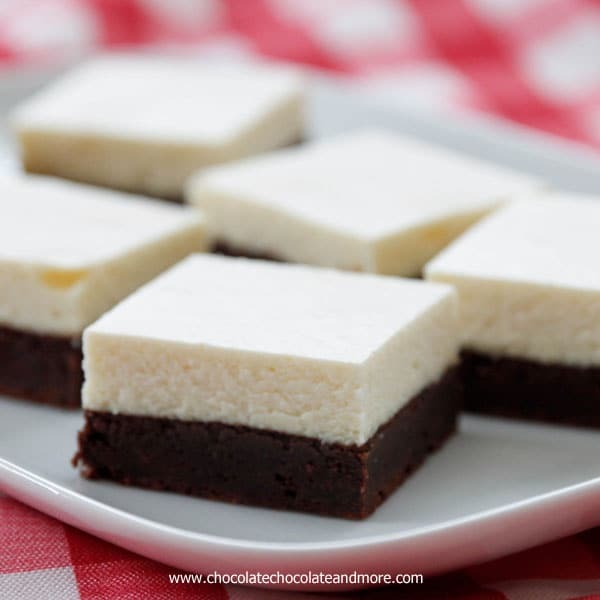 Brownie Bottom Cheesecake Bars-a fudgy brownie bottom topped with a classic cheesecake top, the best of two delicious desserts in every bite! What do you do when you can’t decide which of your favorite recipes to make? You combine them. It happens too often. I know I want to bake. 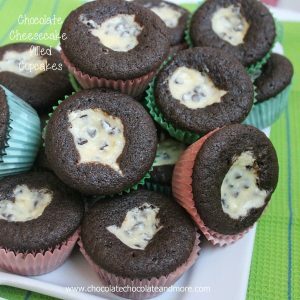 I know what the kids will love (Chocolate chip cookies!) but I want something everyone will enjoy. And I want something cool. It’s summertime. As much as I love a cookie still warm from the oven, it doesn’t have the same effect when it’s almost 100 degrees outside. Cheesecake is always cooling. And creamy. And decadent. And honestly, I love anything that starts with cream cheese. 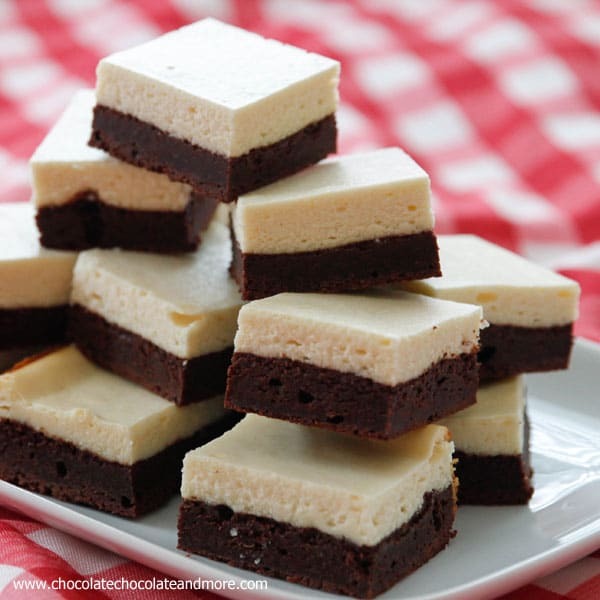 Stacked on top of a rich fudgy brownie and you have a match made in heaven. Or at least your kitchen. You could take these bars to the next level by adding chocolate chips into the brownie, or the cheesecake, or both. You could cover them in a chocolate ganache drizzle. But they don’t need it. Save that chocolate for something else. I use my longest sharp knife, heated in a cup of hot water, then wiped dry for clean slices. Make Brownie Layer-Lightly beat eggs then add sugar, butter and vanilla. Stir well till all combined and butter does not separate from mixture. Sift together flour, cocoa, baking powder and salt. Add flour mixture to egg mixture in thirds. mix just until all blended. Spoon into a greased and floured 9 x 13 pan. (I line my pan with parchment paper.) Spread to edges. Bake in a 350 degree oven for 15-20 minutes, just until crust starts to form on top. While brownies are baking prepare cheesecake layer-In a mixing bowl, beat cream cheese until smooth. Add in sour cream and sugar and beat again. Spoon mixture on top of pre baked brownie bottom, smoothing to completely brownie layer. Return to oven and bake for 30-35 minutes, until center no longer wobbles and edges are just starting to turn golden. Remove from oven and let cool completely before refrigerating. Chill for at least 2 hours before serving. I’m such a sucker for anything cheesecake! 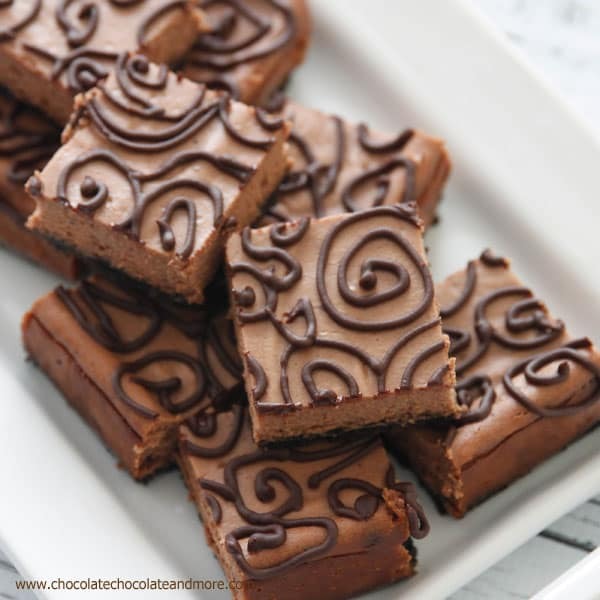 Love the combination with brownies Joan! I noticed how great the slices looked before I read the post. 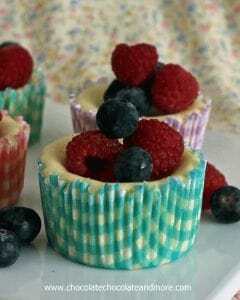 I am sure they taste even better! OHHHWA… NOW YOU’VE DONE IT FOR SURE, THIS SHOULD BE MY BREAKFAST ! So once I regained some control, I started thinking –while drinking my morning coffee–WOW I wonder how this would be with a coffee flavored cheesecake layer ?? So now I will make these first and then maybe later try the coffee…..
anyone else such a coffee lover ? omg, A coffee cheesecake on top would be heaven! I think you’ve inspired me! Joan!! These are GORGEOUS. And my favorite mashup! These are so perfect! YUM!!! These look perfect! I’m not a fan of giant slices of cheesecake, so I feel like pairing it with a brownie crust will solve all my cheesecake problems. Can’t wait to try this! oh wow – they look so delicate and soft!! Too perfect to eat? NO WAY!! Yum! These look so good! 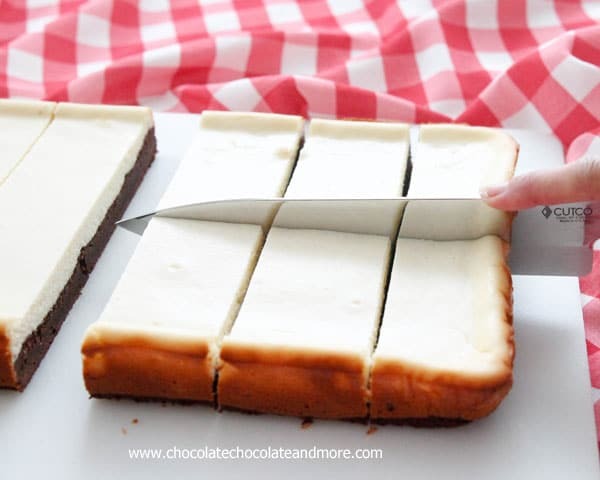 Do you cool the brownie at all before spreading the cheesecake, or just pour it on top while it’s still hot? No need to let the brownies cool since this is a baked cheesecake.